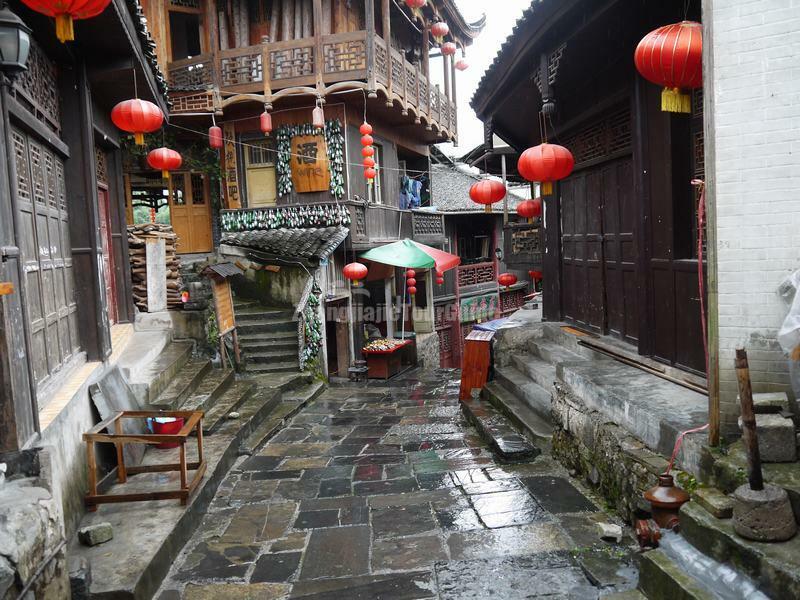 Furong Town, also known as Hibiscus Town or Furong Ancient Town and originally know as Wangcun Village, is located in Yongshun County of Western Hunan Tujia and Miao Autonomous Prefecture. Furong Town has more than 2000 years of history. It was first founded by the King Tusi as the capital of Youyang County in the year of 202 BC, during the West Han Dynasty. In 1997, the town was renamed following the success of the eponymous film, Hibiscus Town (it won the Golden Award in 1987 as best Chinese movie. Furong means Hibiscus in Chinese pinyin). The Tujia people were the original inhabitants of Wancun Village, and today Furong Town consists of a mix of Tujia and Han Chinese peoples. The town is well known for its scenic location, situated on cliffs above a waterfall that falls into the You River. 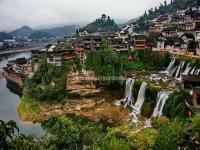 Due to be approximately halfway between the popular tourist destinations of Fenghuang Ancient City and Zhangjiajie. Tourists usually incorpate the town in the hot tour itinerary of Zhangjiajie-Furong Town-Fenghuang Ancient City - Changsha. Furong Town, where everyting is still well preserved, lies on the riverside of You Shui River, its highest altitude is 927, meters whereas the lowest is 139 meters and it is surrounded by a wonderful scenery of green mountains. Walking through the small old town it's very easy and it takes a couple of hours to complete the visit. Following the path that stats from the old town entrance gate and lining an high cliff, you'll first reach one of the beautiful landscape of the town - Furong Waterfall. This waterfall is about 40 meter wide with a drop height of 60 meters, and looks spectacular in rainy season from June to August. Walking behind the hanging water screen of the waterfall is like placing oneself in a crystal palace. The water fall is also the biggest waterfall in west Hunan province, any tourist visits here would see this place and you can hear the crystal sound of the waterfall ten miles away from it. 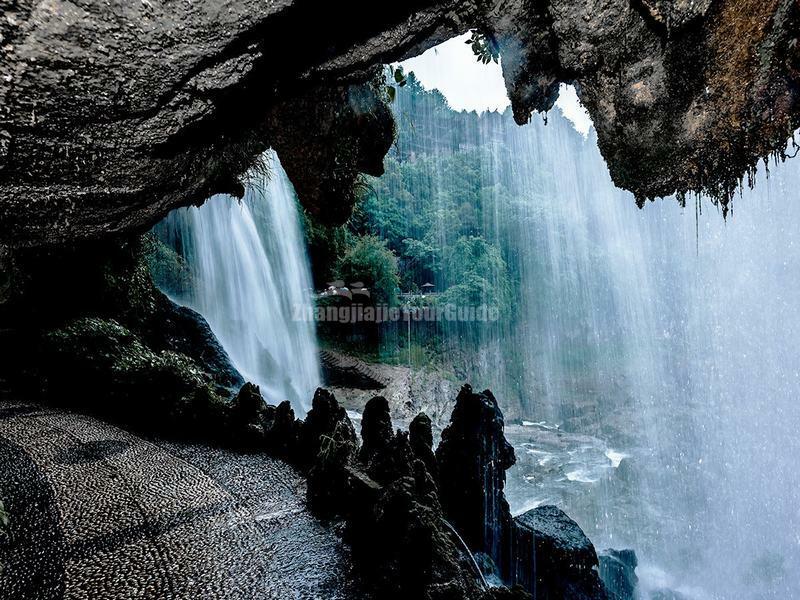 At the entrance of the waterfall, there is a rock cave that is a relic site of the Tujia Ancestors. A local legend says that a group of Jujia people, escaping from central war, came here to survive. Here you'll also enjoy the wonderful and unique view from the bottom of the typical Tujia "Diaojiaolou" building perched on the high cliff. This complex was buitl by a rich chieftain of the Tujia natinality for summer resort. From the palace complex is breathtaking the beautiful view of the ever-flowing stream, its waterfall and the both sides cliffs. The houses were built on the cliffs to make them easy to defend by invaders, in fact, during the ruiling of King Tusi, those "Diaojiaolou" buildings were soldiers' dormitory. Left this beautiful landscape around the bottom of the fall, you'll get the top of the cliff until the Furong jetty on You Shui River from where you can enjoy a different view of Furong Tusi Palace on your left-hand side and where a famous street called Wulichangjie begins. It is 2500-meter long street paved with green flagstone and walking here through the many traditional shops and the old wooden houses with green tiles on both sides of the streets strongly featured by local architectural style it's something really unique that make you feel to be in the ancient times. Also worth a visit the Town's exhibition Folk Museum, where are places many local original machines, objects and tools that show the long and rich history of Tujia people. Displayed in the town's Exhibition also stands the "Xizhou Bronze Column", listed in cultural sites under the national protection as historic evidence of political and military history of Tujia people. 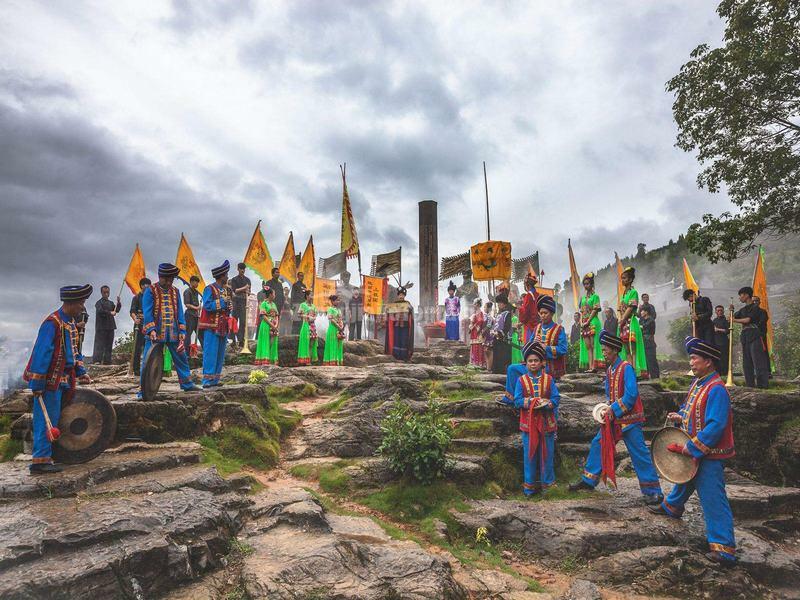 In 1940, Ma Xifan, King of Chu Area reached an agreement of ceasefire with local leader of Xizhou after a long-time war and they make a copper column with the wight of 2500 kilograms and 4 meters tall where they inscribed more than 2300 characters with the story of the war and the items of agreement. Due to it remote geographical location, inconvenient transport and lack of promotion, Furong Town is less popular than Fenghuang Ancient City. But this is also its advantage, as it is more peaceful compared with Fenghuang being stuffed with tourists. 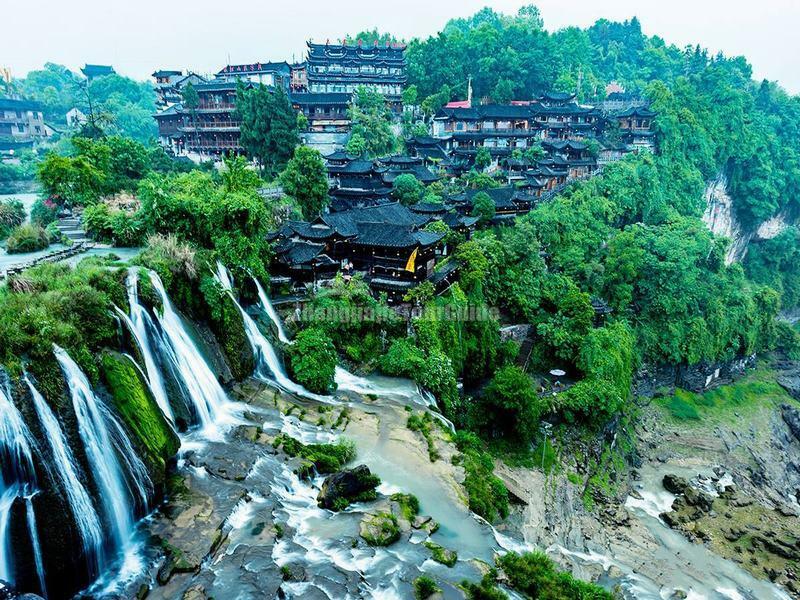 If you have enough time, you can stay in Tujia Diaojiaolou building with waterfall view in the town for one night, to experience the tranquil and peaceful here. Furong Town is the only road to Mengdonghe River. You can go to enjoy Mengdonghe River rafting from the town.